Magnificent 8" Poole Pottery "Bluebird" vase painted by Ruth Pavely, circa 1930s. The "Bluebird" in flight is one of the most popular of the densely patterned art deco vases created by Poole. In excellent condition. Lovely 6" Roger Guerin art nouveau inspired bud vase with metal overlay, circa 1920-1930s. In excellent condition. Stunning art deco box designed by Gunnar Nylund for Rorstrand ALP, Flambe line, circa 1930s. In excellent condition. 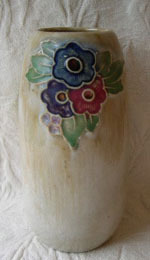 Lovely 6" Royal Doulton vase decorated in cuenca with colorful blossoms front and back. Impressed Royal Doulton with model number and makers initials, MB for Maude Bowden, senior decorator, circa 1920-1950. Minor grinding chip to bottom. In otherwise excellent condition. 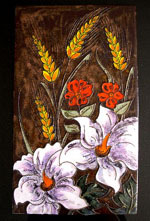 Vibrant 23.5"by 8.75" floral tile handmade by Ruscha Keramic, circa 1960s. In excellent condition. Saint Ghislain 7.5" faience vase designed by Emile Lombart, Form 1808, 1930s. In excellent condition. Faiencerie Saint Ghislain was located in the same area of southwestern Belgium as Boch Freres Keramis near the French border. 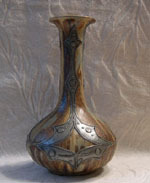 Stunning 14" limited edition Etruscan luster vase by Sally Tuffin for Dennis China Works, 22/25, 2006. 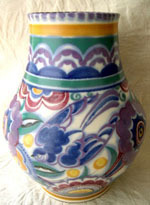 Before designing for Dennis China Works, Tuffin designed at Moorcroft and Poole Pottery. In excellent condition. Fabulous ceramic pipe from Vallauris, France circa 1950s. In excellent used condition. Stand made of leather and mahogany is included. Unverified attribution to Roger Capron.